Ginger Lily (shimmery yellow gold) -- Yellow is my favorite color, so I had to include it in the collection. This feel-good shade was inspired by the glistening golden yellow of Asian Lilies, as well as the bright yellow gold used in Buddhist sculptures and temples. Dragon's Kiss (creamy magenta spiked with black glitter "seeds") -- This luscious shade was drawn directly from the texture and color of ripe red dragonfruit, a popular fruit in the Philippines and Thailand. Blue Lagoon (semi-sheer pale blue with silver micro-glitter) -- This pretty semi-sheer blue imitates the clear, majestic, turquoise waters of Phi Phi islands in Thailand and Palawan in the Philippines. The true beauty of these waters is almost impossible to replicate, so this shade is great for nail art and is meant to be buildable. The Best Part: all Nailtini polishes are 5-FREE -- NO formaldehyde, formaldehyde resin, toulene, dibutyl phthalate or camphor. 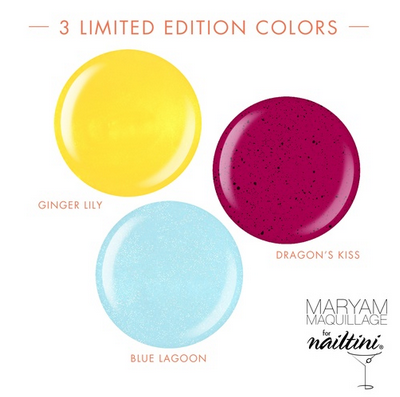 Nailtini remains one of the lowest toxin traditional lacquers available without sacrificing performance or wear. All Nailtini polishes are also paraben-free and cruelty-free in keeping with the company's commitment to social responsibility. Available at Nailtini: $25 for 3. On to the Prom-Perfect Nail Art! Pretty in Pink & Prom Queen - inspired nail art for all the Prom Princesses. I used 2 coats of "Dragon's Kiss" and added a golden tiara using "Ginger Lily" on a fine nail art brush. I accented the spikes of the crown with 1mm rhinestones. Bedazzled, glittery and Cinderella slipper - inspired for Prom! I used 2 coats of "Ginger Lily" and a glitter placement technique to add gold polka-dots. I completed the design with Nailtini "Vodka" top coat. I love the Blue Lagoon! Lovely post. I love how you did the pink nails.